/ News / What’s that hearse doing on campus? What’s that hearse doing on campus? 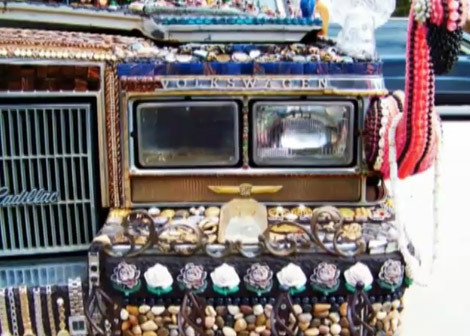 A lavishly decorated hearse, created by New Orleans artist Kelly Israel, will be parked in front of LC’s Daura Gallery on Wednesday afternoon. The hearse, on loan for a few hours from its eight Lynchburg owners, is designed to draw interest in the 4 p.m. opening of an exhibition of American folk art in the Daura Gallery. Yearning to Breathe Free: Contemporary Self-Taught Art from the Collection of Baron & Ellin Gordonexamines both the art – spiritual, whimsical, and raw – and the collectors themselves, whose passion and vision have resulted in a world-class collection. A leaping frog and flowers in a tea cup are among the 41 works of American folk art on display through March 4, 2011. 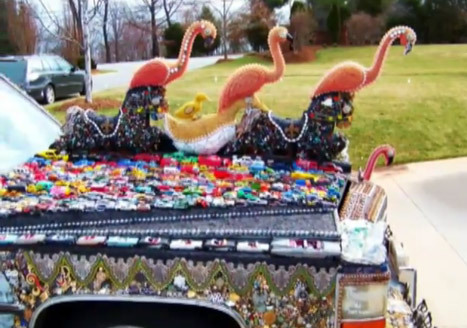 The hearse, which is an extraordinary example of self-taught art, is owned by Mollie and Ray Snead; Doris and Jim Peery; Susan Duerson; Cissa Basten; and Edna and Denny Vaughan, who have generously agreed to display the vehicle during the opening reception. Also check out video of another hearse by Israel.